Hal Goldstein spent his first 35 years travelling, earning 3 masters degrees, and working as a social worker, software engineer, and teacher of Transcendental Meditation. In 1984 Hal and his wife Rita moved from Palo Alto, California to Fairfield, Iowa to participate in a world peace project based on the TM technique. Hal semi-retired in 2011. Today the company publishes an internationally distributed iPhone Life magazine and hosts the popular iPhoneLife.com website. Currently, Hal is writing a book The Meditating Entrepreneurs about the TM meditators who started businesses after heeding Maharishi Mahesh Yogi’s 1979 call to move to Fairfield. 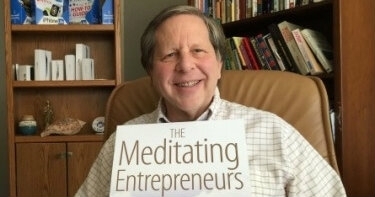 The book and MeditatingEntrepreneur.com website, are based on the course Hal teaches at Maharishi University of Management where guest Fairfield entrepreneurs share their stories and wisdom. Oskar and Hal talk about meditation and entrepreneurship and Hal shares his story about moving from Palo Alto to Fairfield, Iowa.